Before we get into this topic in any detail, first of all, let me say that I’m not crazy about the idea of training dogs to attack. It seems to me that most of the time, if your dog loves you, you’re going to be pretty safe because he will naturally want to protect you. Having said that, though, let me tell you about Janelle. Janelle and I used to work together in the same office. She’d been single for a while, and after a few dates with Darrell, she figured he was the one. We were all happy for her, and Darrell sounded just about perfect. He brought her flowers, arranged romantic little surprises like champagne during a meteor shower and real jewelry cleverly concealed in Cracker Jack boxes, and told her every day how much he loved her. Oddly enough, though, not long after letting Darrell into her heart, Janelle became terribly accident prone. She walked into a lot of doors, tripped and fell downstairs a few times, and even broke her arm slipping in the shower. It took a while for Janelle to smarten up, accept that the dirt bag was never going to change, and kick him to the curb. The problem was, the aforementioned dirt bag was less than willing to accept said kicking, and even a restraining order wasn’t stopping him from showing up and alternately pleading for her to take him back, and threatening her. Janelle couldn’t afford a bodyguard, and wasn’t comfortable with guns, so she started thinking about getting a dog for protection. Now, how to train the dog to attack? If you’re determined to have a dog that is trained to attack on command, this type of training is generally best left to professionals. If you are convinced that you can do the job yourself, though, start with a breed of dog that is naturally protective, and choose one that is a decent size – it doesn’t matter how much a 30-pounder might want to look after you, he’s just not going to be up to the job. And be prepared to commit to thorough training – the last thing you want is to have a dog that goes after people you actually want near you, or one that can’t be called off. Follow these steps to attack train your dog. Be very, very sure, though, before proceeding, that this is something you really want to do. You want a glove that covers your arm as well as your hand. This is your first step, because once the glove is on, you will run a risk of getting injured. Revco Industries makes double-layered Kevlar sleeves that are designed to protect against dog bites. They list for $18.00 a pair, but you can buy them from Amazon for $14.85. Your dog should already know the basic obedience commands (sit, stay, let go, stop, down and heel). 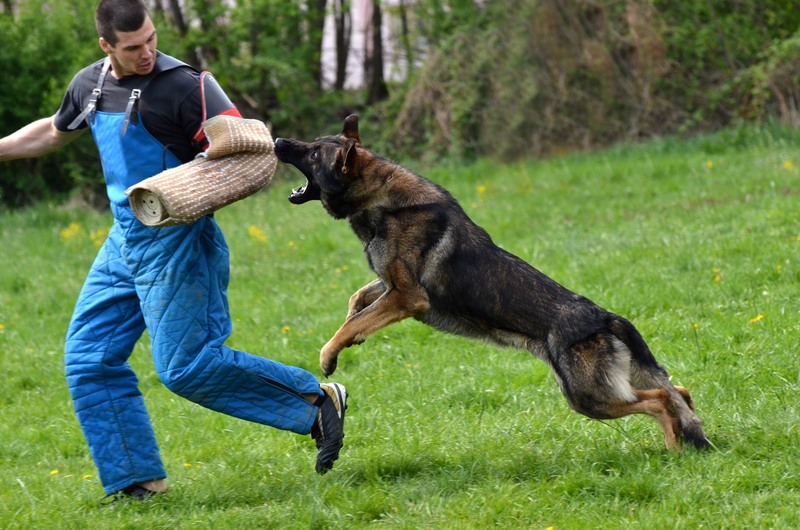 If he doesn’t, you can learn a lot about basic training in my article, Dog Training Made Easy. Tell the dog to sit. Now, start lightly tapping his face with your gloved arm. Your goal is to provoke him into grabbing at the glove. When he grabs the glove, say “attack” in a loud voice. Now praise him, and offer a treat. 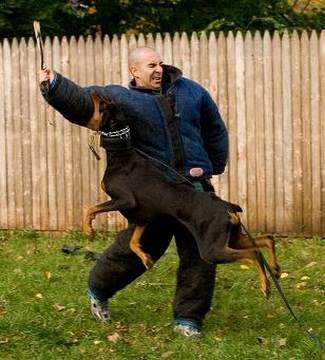 Now, stand away from the dog, and say “attack.” If he doesn’t go for your arm, then you have to go back to steps 2 through 4 and repeat them until he will attack from a short distance. Again, praise him and offer a reward. When he gets it right, reward him. Now try placing your dummy intruder in various locations, pointing at it, and saying “attack.” Keep doing this until you are 100% confident that the dog will go in the direction you are pointing, and not keep trying to come after your arm. I hope you know someone who is brave enough to help you with this next step. Now that you know the dog will go where you point, give the Kevlar gloves to someone that the dog does not know, and have them open the door to your house. Give the “attack” command. I should mention as an aside here, that I am not going to be held in any way responsible if this goes wrong. I am simply offering you the method – what happens if you choose to use it is your issue. If the dog goes for the person who has posed as an intruder, but will back off if you tell him to, then you have successfully attack trained your dog. As I said in the beginning, I am not entirely comfortable with the idea of training dogs to attack. For myself, I prefer to rely on the love and loyalty that our dogs feel toward us, and assume that when the chips are down, our dogs will be there for us as we are for them. By the same token, though, I can understand why Janelle feels safer with a well-trained attack dog. Maybe sometimes, it’s not a bad thing to have a dog that is a skilled protector as well as being a beloved pet.